Argus Never Before Ad 1956 This is a November 19, 1956 advertisement. 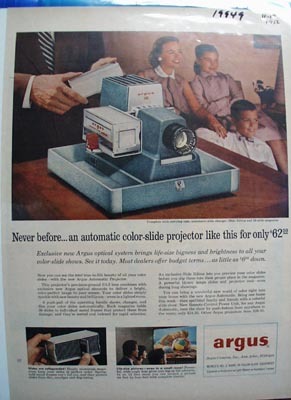 It is a nice color ad from Argus Cameras Inc of Ann Arbor, Michigan. Pictures Mother and the children seated and watching the film while Father runs the projector. It reads, Never before, an automatic color slide projector like this for only $62.50. In excellent condition. Photo is taken through plastic and may show wrinkles or crookedness that is not in the ad. This magazine tear sheet measures 10 1/4"" wide by 14"" tall. Items Similar To "Argus Never Before Ad 1956"